The government is bracing for the arrival of the troika representatives, in an attempt to speed up delayed measures and reforms. 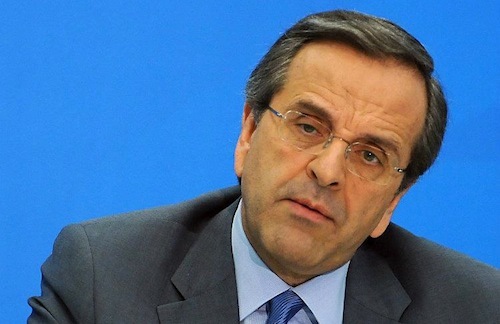 On Thursday, Prime Minister Antonis Samaras meets with the coalition leaders to finalise the list of measures as well as point towards some immediate action plan to cut the public sector. According to Kathimerini, a list with the with the first 20 state organizations from around 250 that are to be merged and abolished is expected to be announced today. The first 20 organizations on the list are to be merged with some 200 regional bodies across the country in coming days and weeks while the full list of organizations to come under the ax is to expected to be made public by the end of August, the paper writes. Government meetings with troika representatives will commence with a list of measures the latter will present, describing the gap between planning and targets accomplished. This list could include actions needed to cover EUR 3 to 4 billion that are missing from the implementation of the bailout agreement. According to media reports, the meetings will be of preliminary character, since neither of the two sides is ready to negotiate directly. Troika heads will have the results of the inspection of the technical staff that show a gap in state reveneue (estimated somewhere in between EUR 2.4 to 2.6 billion) as well as deficits in pension funds and public hospitals (another EUR 1.2 billion). Given the accelerating recession that is expected to reach 7% of GDP, the hole in the budget could reach around EUR 4 billion by the end of the year. Troika people know that the Greek government cannot negotiate new measures. In any case, according to the initial planning, discussions are expected to conclude in late August, setting also the basis for an initial draft of the 2013 budget and the revised medium term financial plan. The next tranche of Eurozone aid is unlikely to be paid before September, the European Commission said yesterday, noting international lenders had to finish an assessment of government-planned reforms that are far behind schedule, Reuters reports from Brussels.